...and still, more crafty ideas! 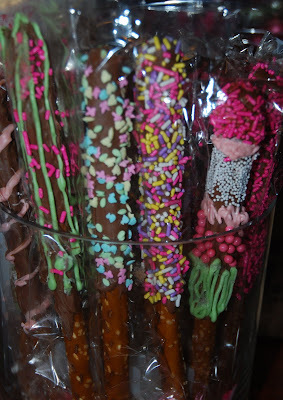 Tonight, Baby Mama Emily came over to my house to help me make the chocolate-covered pretzel sticks that will be part of the "candy buffet" at Emily and Baby Charlotte's shower on Sunday. Here's how they turned out -- pretty great, I think! I still want to make more using white chocolate, so hopefully tomorrow night I'll find the time. Meanwhile, as I was driving home from my day job, I thought about how cool it would be to make little "sour cream containers" for the Hershey's kisses I bought for the candy buffet. So here they are! I whipped up about a dozen of these in an hour or so ... creating the idea takes the biggest amount of time, I think. 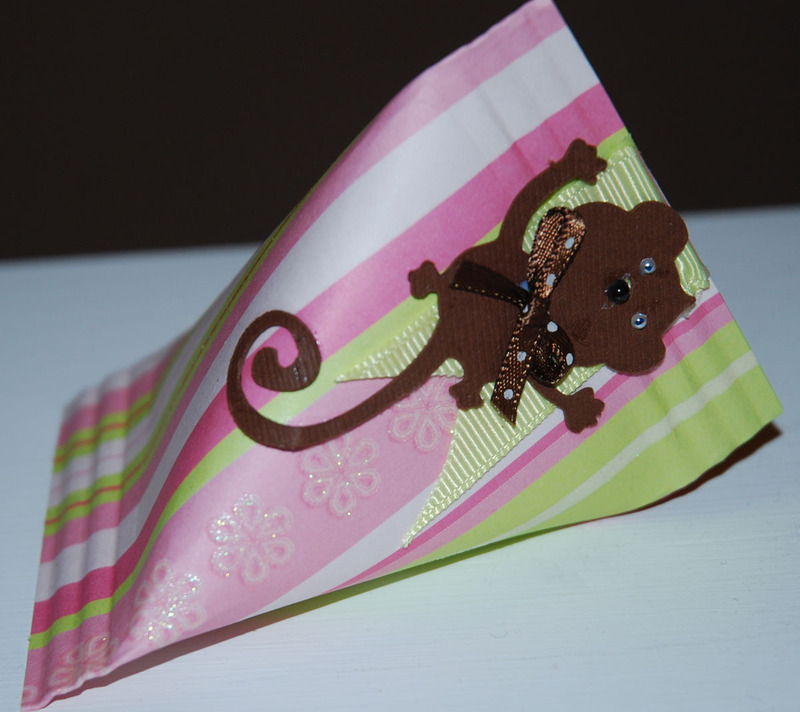 To make these, I cut six equal pieces of paper from a 12x12" sheet (each piece was 6"x4"). I taped one short side and rolled the paper into a tube. Then I pinched the one end shut, using a piece of double-sided tape and a crimper tool. I filled it with 6 Hershey's kisses, pinched and glued the top end sealed (I used double-faced tape), and crimped. Decorated using monkeys from the Cricut Zooballoo cartridge and Creative Charms flowers, ribbons. You did a wonderful job on the baby shower treats. Those sour containers look so cute. I made some for Halloween last year. 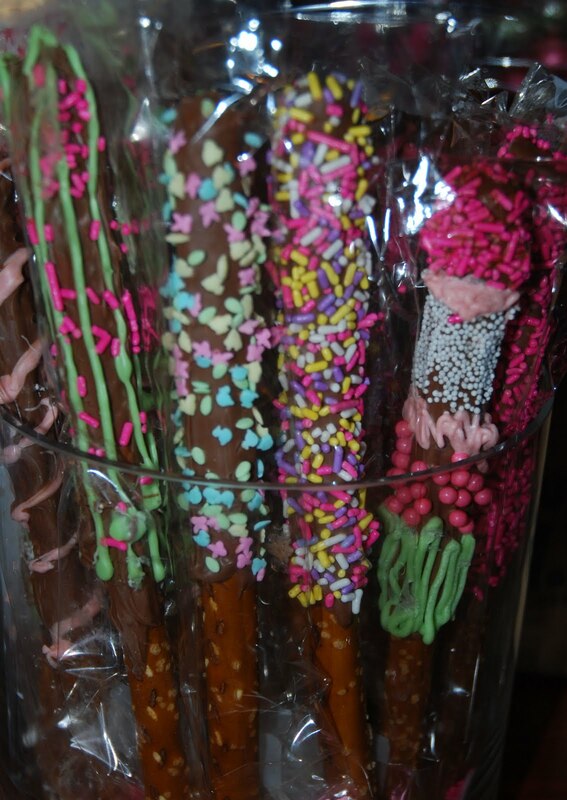 Those chocolate dipped pretzels look yummy. Maybe that would be something my grand kids can make for their class for Halloween this year. Thanks for sharing! Hey, BabE ... A Shout-Out to My Crafting Partner! Thank you for a glorious day! Christmas is coming -- See companion website! Friendship Card -- "I'd Pick You"